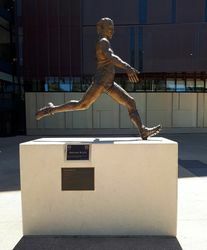 A statue commemorates AFL footballer Malcolm Blight. 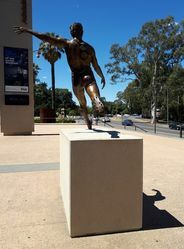 The statue shows Blight launching a long kick while dressed in the Woodville No. 15 jumper. The statue took sculptors Meliesa Judge and Will Kuiper 3260 hours to produce. 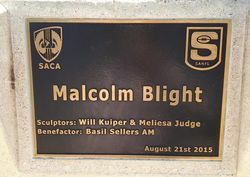 Malcolm Jack Blight AM (born 16 February 1950) is a former Australian rules footballer who represented North Melbourne in the Victorian Football League (VFL), and Woodville Football Club in the South Australian National Football League (SANFL) during the 1970s and 1980s. He is currently serving as a coaching advisor at the Gold Coast Football Club. 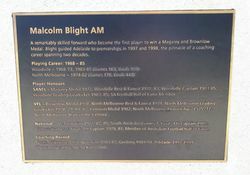 One of few players to have won the Brownlow Medal and the Magarey Medal, and so far the only player to have kicked 100 goals in a season in both the VFL and the SANFL, Blight is rightly regarded as one of Australian football's greatest-ever players. In addition, he has captained the state representative sides of both Victoria and South Australia. A remarkedly skilled forward who became the first player to win a Magarey and Brownlow Medal. Blight guided Adelaide to premierships in 1997 and 1998, the pinnacle of a coaching career spanning two decades. 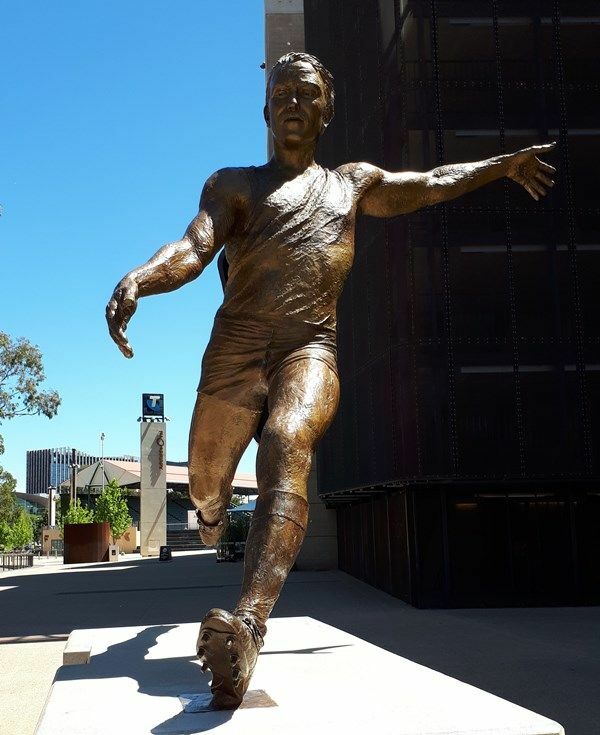 SANFL - Magarey Medal 1972, Woodville Best & Fairest 1972, 1983 Woodville captain 1983 - 85; Woodville Leading Goalkicker 1983,85 SA Football Hall of Fame Member. VFL - Brownlow Medal 1978, North Melbourne Best & Fairest 1978, North Melbourne Leading Goalkicker 1978,79, 81,82, Coleman Medal 1982, North Melbourne Premierships 1975,77, North Melbourne Team Of The Century. National - All Australian 1972, 82, 85; South Australia ( Games 7, Goals 11) Captain 1985, Victoria (Games 7, Goals 19) Captain 1979, 81; Member of Australian Football Hall of Fame. North Melbourne 1981, Woodville 1983-87, Geelong 1989-94, Adelaide 1997 -1999 (Premierships 1997-98); St Kilda 2001.